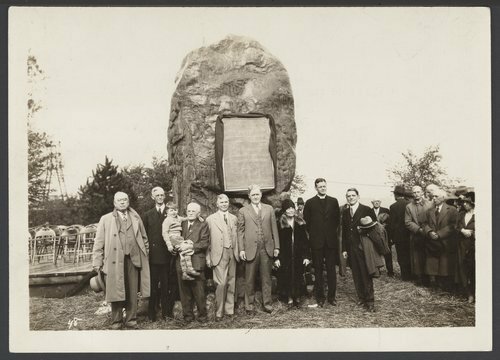 Two photographs showing the dedication of the Shunganunga boulder monument in Robinson Park in memory of pioneers who came to Lawrence, Kansas in 1854. People in the photograph are (left to right): W. E. Connelley, secretary of the Kansas State Historical Society; chancellor E. H. Lindley, University of Kansas; Charles H. Tucker, chairman of the monument committee and his grandson Harry Stucker; Mayor R. C. Rankin; Governor Clyde M. Reed; Miss Hannah Oliver, author of inscription on monument; Rev. Frederick C. Lawrence of Cambridge, Massachusetts, grandson of Amos A. Lawrence, for whom Lawrence, Kansas was named; and Congressman Ulysses Samuel Guyer.